*Prices are indicative and depend on the current gold price, the ring sizes, and current EURO-DOLLAR exchange rates. Shipping costs included, US and Canadian tax rates excluded. 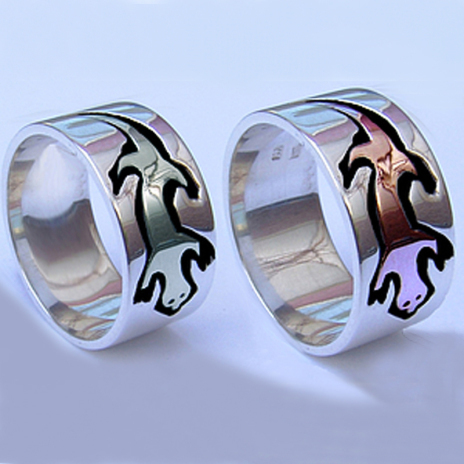 The above image shows a set of "Graphic overlay" Ojibwe-style wedding rings of 14K white gold with yellow and red gold inlay; the interiors are made of sterling silver. The design of the wedding rings is inspired on the pictographic outline drawing style of the Woodland School Of Art. Since he had once saved their distant ancestors from extinction by bringing a healing plant (ginebig-washk or “snake root”) from the depths of the waters, the Anishinaabeg consider themselves forever indebted to NIGIG the otter. According to ancient tradition, WIINABOZHO, the messenger whom GICHI-MANIDOO (the Great Mystery) had ordained to help the People, noticed the poor condition they were in – poverty, sickness and even starvation had plunged them in sheer misery and despair – and he chose the otter to teach them about various remedies and rituals for treating the sick. The medicine men and women and visionaries of both MIDEWIWIN (The Grand Medicine Lodge) and WAABANOOWIWIN (The Dawn Lodge, a counterpart of the Midewiwin) regarded therefore NIGIG, along with MIKINAAK the turtle, as a symbol of healing and bringer of new life, and they elected him first and leading patron of their powerful Medicine Lodges. Because of his habit of rising to the surface at night and then plunging under again, NIGIG is symbolically linked with the moon, and thus also associated with several rites of initiation. Because of this, the MIDEG (Mide priests) are still in the habit of keeping their MIDE-MIIGISAAG (sacred Cowry shells) in a NIGIG-MIDEWIYAAN: a bag of otter skin (see inserted image, an image of a Midewiwin "Sky Man" holding an otter medicine bag painted by the late Norval Morrisseau).